Garages are easily susceptible to water damage. They provide many easy points of entry for water from a rain storm or flooding, and are often not as waterproofed as the rest of the house. On top of that, many households do not monitor their garages often, so extensive water damage can occur before the problem is even spotted. Do not let water invade your garage this year. Taking a few simple steps can help you prevent damage to your foundation, garage, and the items within it. Most garage owners have faced intrusive water at some point. Water can sneak into your garage in many different ways; through leaks in your garage floor or walls, under doors, or through holes in your roof. The biggest danger of water damage in garages is that it often goes unnoticed. Most household garages are used for storage. Stored items like boxes or unused furniture provide perfect hiding places for water to pool behind, underneath, or be absorbed. Many people do not spot the early signs of water damage, and end up noticing only after the water has pooled severely, leading to potential damage to the structure of your garage. 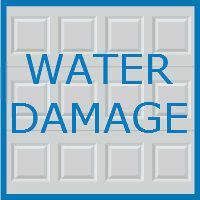 On top of garage water damage being hard to spot, your garage is easily the most vulnerable room in your home to water. This is largely due to your garage door. Garage doors are opened and closed frequently, making them vulnerable to the elements. They can become damaged, leaving room for water to enter through cracks in the door or on the ground if not sealed properly when closed. Many garages also don’t feature rain gutters, allowing water to easily pool up on the ground right outside. Water pooled up anywhere outside a home can allow water to seep in through cracks or holes. If water is allowed to build up in your garage, it can cause serious damage to the foundation of your home, or lead to health problems thanks to mold and mildew. By the time most people notice water in their garage, the damage is extensive and costly to repair. Rather than catch the problem after the fact, a few preventative measures can really make a difference. Start with your garage door. Many doors are not sealed properly with the floor of the garage when closed, allowing easy access for water. Installing or replacing the weather stripping on the bottom of your garage door can help. This may need to be done a few times a year, but it can make a big difference, especially in areas where flooding is common. It is also important to repair any cracks or holes in the door. To ensure that your garage door is sealed, simply turn on the light in your garage, and stand outside, preferably at night. If you can see any light poking through your garage door, it is not completely sealed. Water can also enter your garage from above. Leaks in your roof can allow water to seep into the ceiling of your garage, leading to large water damage stains. Water leaking through the roof of your home can also damage sheet rock, drywall, and any electrical work within the walls or ceiling. Be sure to check for any entry points on your roof, and make any necessary repairs. Rain gutters can also help divert rainwater from pooling up right outside of your garage. The gutters need to be cleaned often so that water can easily be channeled away from your garage. All too often gutters are left clogged, causing leaks or overflows. Clogged up gutters can also also lead to seepage into your roof. If you live in an area where flooding is common, more preventative measures may be necessary. No one likes to admit defeat, but if water damage is inevitable, be sure to store any items well off the ground. Then, if any water does get in, at least your items are safe. Always store the most valuable items the highest off the ground, just to be sure they will be okay. Another smart move is sealing your garage floor. That way, water cannot seep into the floor and cause foundational damage. If you take these few small steps each year, your garage will be well protected from water. Your garage is an expensive and important part of your home, so damage preventing measures are necessary. For other garage tips and ideas, be sure to watch this blog. 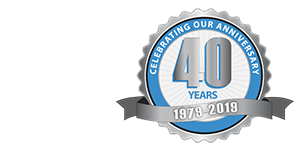 To learn more about the services we offer in the Chicagoland area, contact Blue Sky Builders online or call (630) 852-8485.